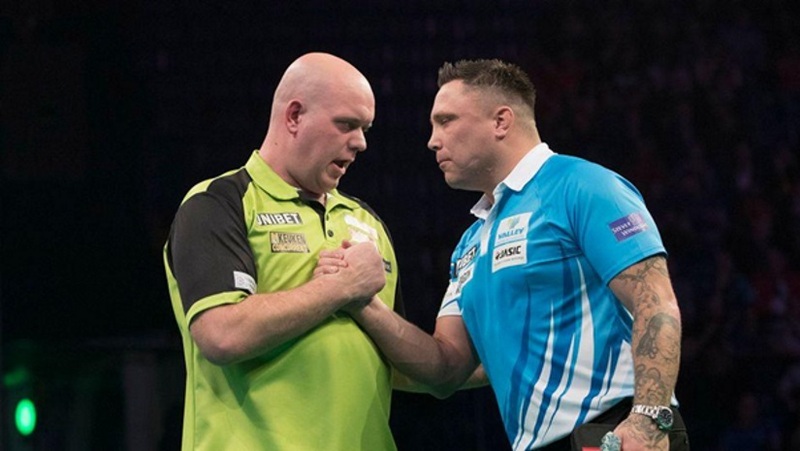 Michael van Gerwen returned to his imperious best last week as he shattered Gerwyn Price’s unbeaten run with a brilliant 7-2 victory over the Welshman in Nottingham. It was a surprisingly low-quality affair with oddly low averages in the 70s and 80s early on for both players. It wasn’t until the eighth leg when MVG kicked the match into life with a 132-checkout on the bull for a 12-darter that the game finally showed some class, while also putting the Dutchman 5-2 ahead. One round earlier, Mighty Mike took out a 13-darter just as he did in the ninth leg to guarantee himself at least a point. He took both, however, after he claimed the last in style to bring his final average up to 96.98 compared to The Iceman’s 92.95. In the night’s first action, Michael Smith claimed a much-needed victory as he comfortably saw off the challenge from the latest contender Nathan Aspinall in a 7-2 mauling. Last year’s runner-up raced into an early 4-0 lead before The Asp finally got points on the board before claiming the following two legs for good measure. Then it was Bully Boy’s turn to two claim two legs on the spin to take things to 6-2 before he wrapped up neatly with a match-winning 127 checkout. By the end, Smith averaged 93.99 over Aspinall’s 88.35. James Wade surrendered top spot in match two as he was surprisingly shot down by Mensur Suljovic, who produced his best performance of the season so far. In a 7-3 victory, The Gentle averaged 101.38 and fired six 180s to overcome The Machine who had, only two weeks before, beaten Michael van Gerwen prior to recording the 10th whitewash in Premier League history over Daryl Gurney. In contrast, Suljovic had found himself adrift from the pace setters at the top having only won one match prior to his meeting with Wade. Scoring a match-high checkout of 109 in leg six, Suljovic moved into a 4-2 lead before Wade banked an 11-dart leg, from a finish from 76 to stay in the game. From there, The Gentle reeled off the next three legs in 14, 15 and 16 darts to send The Machine packing with an average of 97.05. Rob Cross became the third player to sit at the top of the Premier League table after he recorded an impressive 7-3 victory over Raymond van Barneveld, who remains rock-bottom in his farewell season. Voltage made it three wins in a row to take his tally to nine points from six games, dropping just seven legs in his last three. In a messy end to the match, Cross took 18-darts to seal the victory as well as an average of 102.85 which included three 180s to Barney’s four. Van Barneveld, still without a win, has only managed two draws so far but was showing signs of a fighting spirit at 2-2. He then missed two chances at tops, which allowed Cross to run off with the contest. Barney finished the evening with an average of just 92.27 and the knowledge that, unless something changes soon, he’ll be saying goodbye to DPL for good on Judgement Night on March 28 in Rotterdam. Thursday night’s action concluded with Daryl Gurney and Peter Wright sharing the points in a 6-6 tie. Snakebite looked like he would be taking all the points himself only to see Superchin rescue a draw from the jaws of defeat to end a dismal run of form for the Northern Irishman. Coming off the back of 7-1 and 7-0 Premier League defeats to Rob Cross and James Wade respectively, coupled with an early UK Open exit, results have overseen an alarming drop in form for Gurney. He looked to be heading for another bad result after finding himself down 6-3 to a superior Snakebite. On the way to his lead, which guaranteed him at least a point, Wright landed a 90 checkout as part of an 11-darter before repeating the trick from the same score only this time on the bull. In true Wright style though, the victory wasn’t snatched as it should have been. Gurney, the 2018 Players Championship Finals winner, reeled off three successive legs in 13, 14 and 14 darts to nick the draw despite averaging eight points less than Peter Wright’s 102.91. Rob Cross looks to finally be back to his best, or at least something like it, which makes the night’s opener against Gerwyn Price an intriguing tie. Fresh off the back of his 7-3 win over Barney, he meets a Price that was put firmly in place a week ago but who was unbeaten prior to that. Given that his one defeat so far came against a rejuvenated MVG, last week’s poor result can be forgiven. On past form, the Welshman has won two of his five matches against Cross but has, last week notwithstanding, enjoyed a decent campaign so far. On form, Cross should take this one, but don’t be surprised to see The Iceman result to his old antics which may or may not be appreciated by the Berlin crowd. It’s a close one, but I’m siding with Price on this one. Next out are James Wade and the ever erratic Peter Wright. Snakebite threw away a point last week against Daryl Gurney to give him his third stalemate in six matches. Despite another winless week, Wright still fared better than this week’s opponent, who himself suffered a blow with a surprise defeat to Mensur Suljovic. The Machine has otherwise performed well so far this season and was top until last week’s defeat, which he will hope was a one-off. A close game is expected but Wade should just about edge it. Michael van Gerwen was back to his winning ways last week as he made short work of Gerwyn Price even if the score line did flatter him after another off key performance. This week he faces Daryl Gurney fresh from rescuing a point a week ago, but with a continental crowd behind him, and seemingly able to win while underperforming, Mighty Mike should have enough to see off Superchin, who has only won seven legs in the past three weeks. Match four pits Michael Smith against Mensur Suljovic. Last week in Nottingham, Smith saw off the challenge from this season’s latest contender, Nathan Aspinall, and will be looking to keep up the momentum. That said, Mensur, too, took home all the points last week as both players seek for the kind of form that has so far eluded them previously. Despite Bully Boy being installed as the obvious and natural favourite, The Gentle has more than enough to present a challenge to Smith and something is drawing me to the Austrian this week. Wrapping things up this week are Raymond van Barneveld and Max Hopp, the newest contender who hails from Idstein, near Frankfurt as the League heads to Germany, albeit Berlin. Barney’s last-ever showing at the Premier League before retirement is not exactly going to plan as he currently finds himself three points adrift of safety with Judgement Night fast approaching. Ordinarily, the popular Dutchman can count on strong support from the crowd but facing a German in Germany might just impact on this. Nevertheless, I expect Barney to finally get off the mark this week with a win in Berlin. So then, this week’s acca looks as follows; Gerwyn Price, James Wade, Michael van Gerwen, Mensur Suljovic and Raymond van Barneveld, which pays at 58/1 with Betway.